Python Manufacturing paves new territory in India — RandallAnthony Communications Inc. When most people think of products shipped to India from Saskatchewan they think of potash and other commodities. But there’s a new homegrown product India is now seeking from the province – a high-tech pothole filler. Potholes are a big problem in Indian cities such as Bangalore, due to their dense population and high volume of traffic. If not fixed, these potholes can be deadly, especially for those travelling on bikes, motorcycles or other small vehicles. 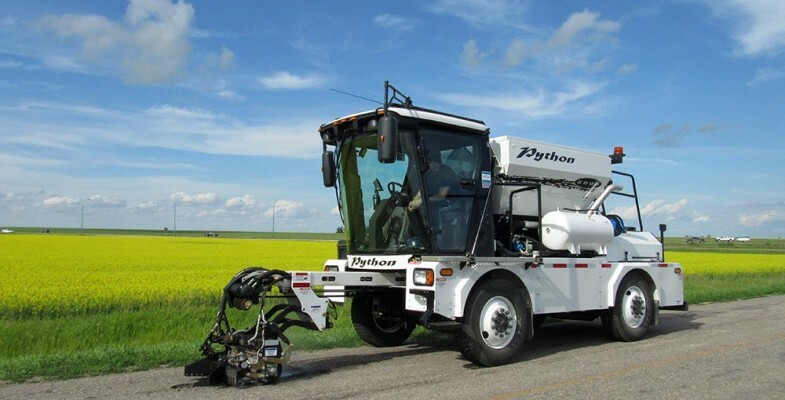 Regina-based Python Manufacturing Inc. is meeting that need on the streets of Bangalore with its Python 5000 self-propelled pothole-patching machine. There’s one fixing the potentially hazardous potholes in India’s third-largest city right now, and three more on order from Python. As Python has learned, doing business in India requires patience. Python first got the call from an Indian-based company called American Road Technology & Solution. (ARTS) in February 2012. After a few trips back and forth between India and Saskatchewan, involving representatives from both sides of the transaction, ARTS agreed to buy one of the patented machines, valued at $290,000 each. The first machine was shipped in December 2012. It took more than a month to travel by boat to India and was held up in customs until July 2013. It wasn’t until last fall that the pothole patcher finally hit the streets in Bangalore. Despite facing India’s abundant low-cost labour market, Python’s high-tech solution is competitive. The Python 5000 machine can be operated by one person and will repair a pothole in less than three minutes, according to the company. Saskatchewan’s Les Hulicsko created the machine more than 20 years ago, when about 25 models were sold. It was recently redesigned and reintroduced with some new technology. Today, there are about 20 of the new machines operating across North America, in Brazil and now in India. Python is looking to grow all of its markets, but believes India will be key.